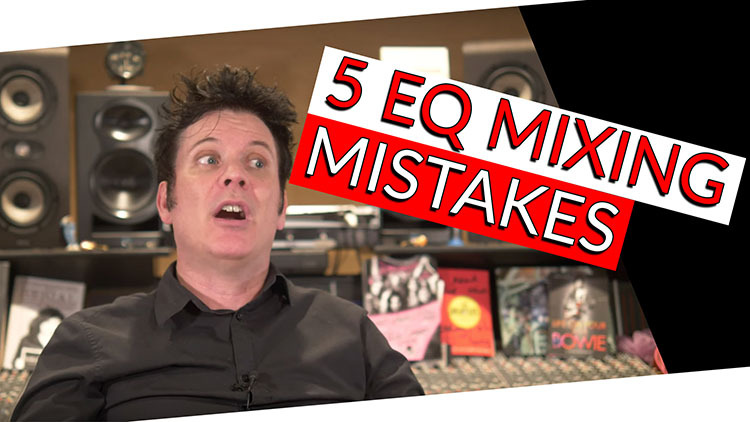 In this Episode, we’re going to talk about 5 EQ mistakes we make while mixing. These are 5 EQ mistakes I see as a reoccurring problem that I have had over the years that I have finally come to terms with, and get asked about all the time! Don’t pull out excessive EQ on the Mix/Master bus find the source and treat out there. Mastering Engineers generally only work with a stereo mix, so they are cutting and boosting frequencies with that limited amount of tracks. As Mixers we have so many more options available to us! If there is a build of ‘mud’ in the mix, find it’s source, it’s typically the low mid area from 250-450hz, that build up is very typical in drums. If the mix is excessive bright find the causes, typically a high level of 3-5k on instruments and vocals and bring the boosts down. Mixing loud dulls your hearing specifically in the high end and high mids. Pull up a mix the day after a long, loud, late night mixing and more often than not it will be extremely bright, especially where your ears are most sensitive in the 3-5k area. When you find yourself reaching for high levels of top end at end of a long day it’s time to take a break and get back to the song with fresh ears the next day! This is huge, creating clarity in the low end is extremely important! Just because your speakers don’t play back 20-30hz doesn’t mean it’s not there! Keeping excessive low end does not make it sound fatter it makes it sound muddy and cluttered! High bass your bass so there is room for your kick, it doesn’t have to be a steep high pass, but 50hz and below gently cut will help the bass bloom and the kick pump nicely. Removing anywhere from 90-150hz and below with a gentle slope on guitars will let the low end of your Bass breath! Low passing electrics anywhere from 6-10k above will let cymbals breath (higher for metal guitars, lower for classic rock guitars). This one I have done many times in the past! We’ve all done it, we go searching for that errant frequency, we find it, maybe in the mid range, it’s annoying us. However, now the high end is little to prominent, so we cut some high mids, now the low end is too much so we cut a couple of low end frequencies and so on and so forth. Before you know it you’ve got a really dull sounding heavily EQ’d lifeless sound! This is where Dynamic EQ can really save you! Yes, there is an annoying mid range frequency, apply a dynamic EQ to just catch it when it’s too much! This can save you hours of going down a rabbit hole! Working in Solo is inevitable, to hear any subtle changes or to identify specific issues we will always reach for the solo. Bypass your EQ plugins and listen closely to both the individual track and the entire mix. Then ask yourself the question: Have you enhanced the signal with the adjustments you’ve made? Shelly Yakus once said to me ‘Is it better? Or is it just different?’.